Like all animals, humans are naturally inclined to take the easy way, seeking pleasure and avoiding pain. In the wild this bio-hoodwink usually works out well. These attraction and aversion instincts drive life, from ants to dogs to people. 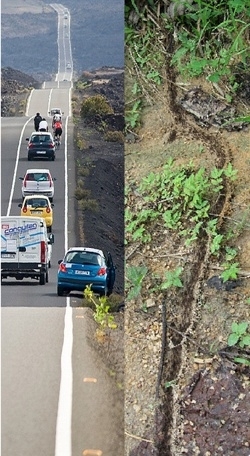 The first photo exemplifies this with a human highway on the left and the ant highway on the right. Both species are just trying to make life as easy and efficient as possible. See Ants are Us, for other similarities between humans and ants. Over time, this drive has lead humanity to develop tools and materials to make life as comfortable and secure as possible. The instinct ‘more is better’ lies behind the urge to fatten up whenever possible in the wild — who knows when the shortfall is coming! The seal in the next photo feels it has to eat its fill while it can. 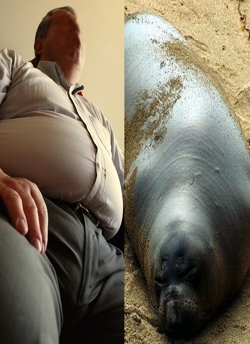 The human male next to the seal is no different; his biology does not know the supermarkets are always overflowing with food, nor the risk of continually overeating (1). While we are utterly natural in pursuing pleasure and avoiding pain, we are not living under the wild conditions that those instincts evolved over millions of years to handle. The instinct to take the easy way in conjunction with our ‘wild’ ability to succeed at doing so causes escalating imbalance. We increasingly face too much of a good thing. Alas, giving up some of our ‘good thing’ is biologically challenging, and so we remain bogged down in difficulty (2). Any species that evolves capabilities that allow it to circumvent nature’s counterbalancing forces would naturally evolve further to bring it back into balance. Either that or become extinct. Of course, external conditions can also change quickly to a degree that brings it suddenly and lethally out of balance (e.g., a comet visited the dinosaurs, humans visited the dodo bird). As other creatures of Earth, we simply respond to life’s circumstances in overall ignorance of the consequences. Like other life forms, we react to conditions and adapt accordingly. The unusual and ironic thing about humans is that human knowledge is a major source of our ignorance. Other animals are just ‘dumb’ and ignorant; we are ‘intelligent’ and ignorant. As chapter 18 hints, When cleverness emerges there is great hypocrisy; as chapter 16 warns, Woe to him who wilfully innovates while ignorant of the constant; and as chapter 70 observes, It is because people are ignorant that they fail to understand me. (1) Toward my late 20’s, I found myself gaining weight ‘naturally’. My diet wasn’t changing; my biology was. When I quit smoking, my weight really shot up. I was replacing the pleasures of tobacco addiction with the pleasures of rich food. As Buddha’s Second Truth points out, if I had continued taking ‘pleasure’s bait’, the result would be pain. I’d probably be morbidly obese today. We burn fewer calories as we age. This slow-down prepared us in the wild for becoming less able to hunt and gather and less able to recover from injury. Our biology still responds as though we are living in the wild, even though our mind knows otherwise. There is a colossal disconnect between who we are biologically and our civilized circumstances where rich and abundant food is normally available continuously, (i.e., refrigerators, super markets, restaurants). Interestingly, it took me some 10 years to unlearn the ‘eat today for who knows tomorrow’ approach to life that my years of a vagabond life abroad helped to ingrain. It simply took me that long to settle down psychologically enough to know food was always at hand. It took me even longer to know I needed to rein in the pleasurable ‘more is better’ drive. Though I theoretically understood that ‘short term pleasure attracts long term pain’, it took time and experience to begin to put that preaching into practice. (2) Here are a few passages from Chapter 63 that speaks to the obvious difficulty we face. make something big by starting with it when small. big things must needs have their beginnings in the small. Therefore, even the sage treats some things as difficult. That is why in the end no difficulties can get the better of him. Damn straight, Jamie. For me, the whole point of the tao is that everything that happens, EVERYTHING without exception, is a part of the tao. I find it helpful to remember that whatever happens to us (or around us), no matter how we feel about it at the time, it’s taking us where we’re going. In fact, I’d go further and say that nothing is even “not beneficial”, it’s just beneficial in a roundabout way. People think in beelines, but the tao frequently takes the long way home. But I hear what you’re saying about inner alchemy. It’s often challenging for me to reconcile my sense of wu wei with my desires to become more balanced and aspire to higher consciousness. In the end, I usually come back to the idea of letting it happen to me naturally, just like everything else. Great post. It has irked me from alleged Taoist “masters” who talked about the “unnaturalness” of certain actions, as if those actions were somehow outside of the Tao, which makes no sense at all, and in my opinion, reveals their ignorance. What I think they meant is that what is “unnatural” is better labeled “not beneficial”, and thus the point of what the true masters talked about when they discussed inner alchemy.